Want to know the best part about eating clean? I get to eat so much food and still stay lean! You can eat a lot more whole foods than you can processed foods for the same amount of calories. I haven’t done one of these posts in a while so thought I would share pictures of a typical day’s worth of food for me. People are always shocked when they see how much food I eat! Actually, it wasn’t until I increased my calories and started eating every three hours that I started seeing results and getting leaner. It took a little while, but once my body started to trust that it was going to get fed on a consistent basis, it increased my metabolism, and I started burning fat so much faster. Meal 1 – 4 egg whites, 1 whole egg, spinach and black pepper scrambled with spinach and reduced sugar ketchup. 1/2 cup steel cut oats (measured dry) with almond milk, cinnamon and 1/4 c. frozen blueberries. Meal 2 – 1/2 cup Lactaid brand 1% cottage cheese with unsweetened cocoa powder, 1 packet Truvia, and 1 Tbsp almond butter mixed together. 1/2 red pepper and 1/2 cucumber on side (pre-cut and bagged over the weekend so easy to grab and go). Meal 3 – 2 slices Food for Life brand Ezekial toast with 1.5c homemade ground turkey spaghetti sauce. Salad with red bell pepper, cucumber, and Little b’s Clean Poppyseed dressing. Meal 4 – 5 ounces of rosemary sweet potato bites (sweet potatoes diced and baked with olive oil, rosemary, garlic powder, black pepper, sea salt – cooked in bulk over weekend and 4 ounces of garlic lemon chicken (cooked in bulk over weekend). Handful of celery stalks on side. Meal 5 – 4oz wild salmon (that I caught myself!) baked with lemon juice and Mrs. Dash Original Blend. Asparagus on side. Meal 6 – 5 egg whites mixed with unsweetened cocoa powder, 1 scoop KAL brand stevia, 1 tsp orange extract, almond milk (cooked in microwave for 4 minutes). I know this meal doesn’t look very pretty but it actually tastes pretty good. It sort of (in a weird, healthy way) reminds me of the orange chocolate oranges we used to get in our stockings at Christmas time. Not exactly, but sort of. Click HERE for the recipe. Post Workout – I have a little trick for post workout that James Wilson- Faith, Family and Fitness taught me. If you join his 12-week training program you will learn how to do it too. Hey Natalie!! 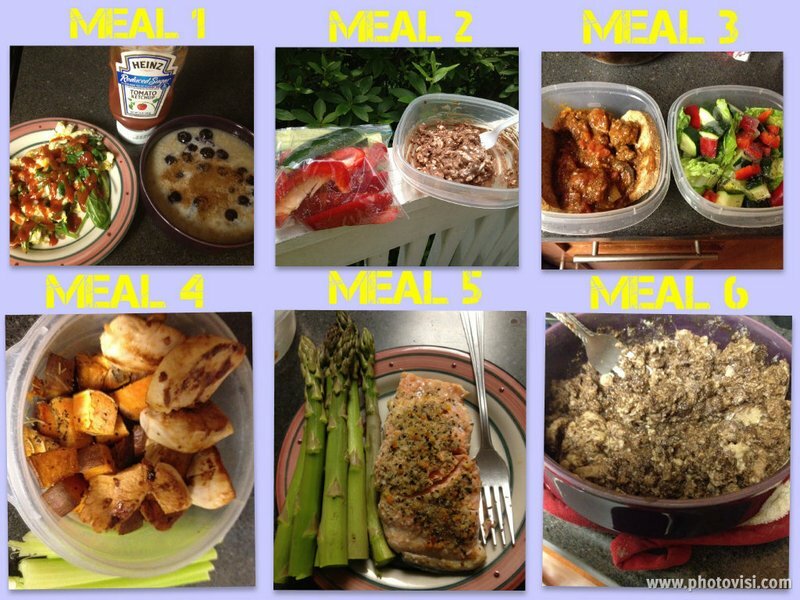 Can these sample meal plans be used for any of us on Jamie Eason’s LiveFit Trainer? Or do we need to factor in our own height and weight? Hi Natalie! Can you give me an idea of how many grams of protein the above meal has? Do you monitor that? Thanks! Tried meal 2. I wish I could stomach cottage cheese, otherwise, it would be really good! which ones are your pre and post meals? I am still learning to center those around my workouts. I usually start workout after work around 5, but the weekend I try to do morning workout. Thanks. How much do we need to be working out to eat all that? Do you workout once or twice a day?